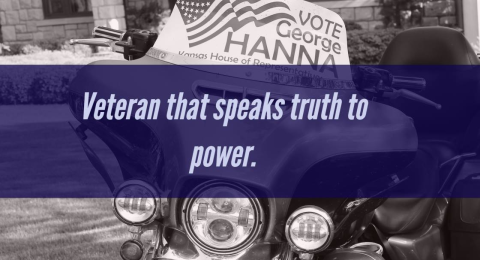 My name is George Hanna, and I have been a Democrat here in the state of Kansas since 1988. The reason I registered as a Democrat when I was 18 is because my story begins at the age of 12. I was what is commonly referred to as a throwaway teen. At the age of 12, neither myself nor my parents were emotionally capable of providing a nurturing environment. I was in and out of group homes. I lived on the streets the majority of the time. I have lived in newspaper recycling bins, I lived in a box underneath of a construction trailer, and I was a migrant worker. Needless to say my future was bleak. I do not regret this time in my life because it has allowed me to take a great sense of pride in my accomplishments while still recognizing the needs of others. Today, I have been a husband for nearly 30 years. I’m a disabled veteran, a proud father and grandfather, and very politically active. I’m sure I don’t have to point out the odds of a throwaway teen graduating college and being successful as adult are less than 1%. If it were not for one particular social worker’s kindness, and some of the social programs in place that provided me the time necessary until I met my beautiful wife, I most certainly would now be in prison. It is for these reasons that I fight for tolerance and acceptance today. Starting in 1992 I became politically active fighting against the hatred of the Westboro Baptist Church on behalf of USD 501. Then I became the president of the Kansas Association of Public Employees Union chapter for the city of Topeka workers after fighting and organizing for a year to unionize the city of Topeka employees. I have volunteered for political campaigns that include Jim Slattery, Joan Wagnon, and Kathleen Sebelius. In 2008, I must admit that I was conflicted on if I should continue to try and save the party I once loved or abandon the party all together. Citizens United and big donors were taking the middle class vote and power away. My profound disappointment in the Democratic Party is because the party I once knew and was proud to be part of has homogenized with the Republican Party and failed to listen to it’s own members. The ideology of the current Democratic Party fails to reflect the constituents of that party, only focusing on the greed allowed to them by the citizens united judgement. It was then when I saw Bernie Sanders fighting for nearly 9 hours on the floor where my conviction was reinforced. I lobbied his office starting in 2014 to run for president, I campaigned, I went door-to-door, I was the caucus captain where we doubled the turnout of 2008 and I became the only male National delegate for the Kansas 1st Congressional district for Bernie Sanders. I couldn’t have been more proud of the direction our party was going. Needless to say the year 2016 was exceptionally difficult for me to handle. Yes, I’m extremely disappointed that Trump won the election, however, I am equally disappointed about the corruption of the democratic process, the most important fundamental we have as a country, Citizens United must be overturned. big money in politics undermines the very fabric our our democracy. It is for these reasons that I find it even more critical that we, the Progressive Movement within the Democratic Party, fight even harder to reform the party from within. If we fail to evolve as a party, the ideologies of the current Republican and Democratic Parties will prevail. Unfortunately, regardless of which current party is in power, the middle class will suffer and those left on the streets will all but be forgotten. I can’t allow this to happen and nor should you. 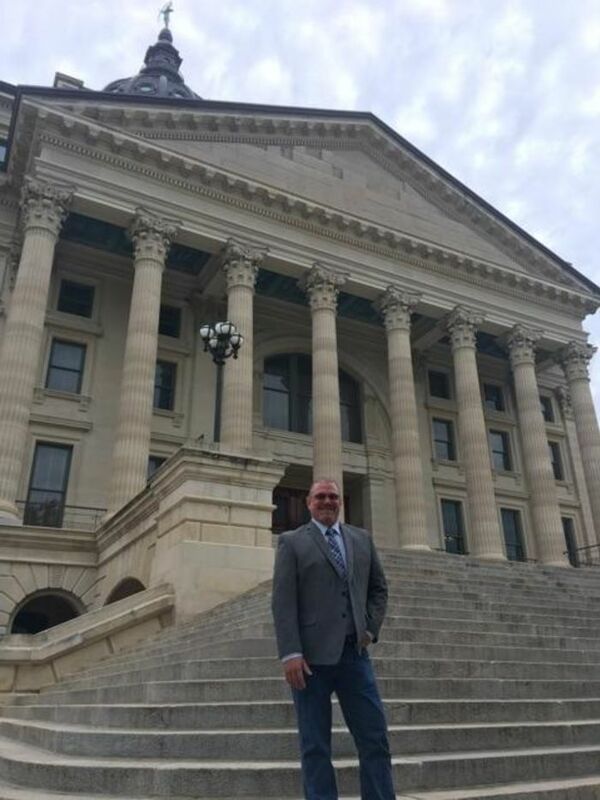 In an effort to Rally the progressives in our state, the very state where the term “progressives” was born, I ask for your help in electing me as your representative in Kansas House Dist. 47. First grade, 1976 at Oskaloosa. I apologize, I didn’t meant to drudge on. I guess that is why I am so passionate about successes for the party and take it very personally when I see the corruption. I can only imagine how minorities, people of the LGBTQ, and newly immigrated feel. Diversity is the strength of our society and what made the USA a leader in the world. I will fight for equality for all. I sincerely thank you and hope to see you in the future.